Do you own an “i”Device? You know…An iPhone. An iPad. An iPod Touch. Well, if you do, and if you are anything like me, then you are probably always looking for the newest and best educational Apps that will launch your children into an even higher level of brilliantness (because they are ALL brilliant, of course, right?). And yes. If you are like me, you are also wanting to feel better about the time your children spend playing with these devices. I know, however, that I can easily be overwhelmed when I go to the iTunes store and sit faced with the hundreds of thousands of Apps available. And even though I developed two of those Apps (and understand how to navigate around that store), I still get lost. 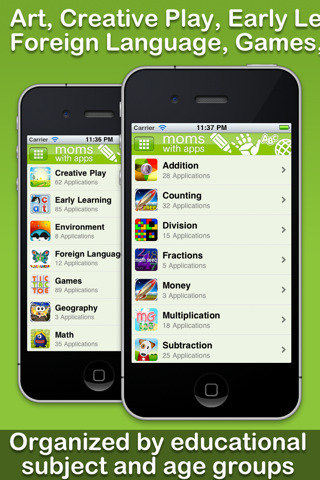 Last year, I joined an amazing group of parent App developers called Moms With Apps. This group has a single mission in mind. And that is to be “a collaborative group of family-friendly developers seeking to promote quality apps for kids and families”. It is the community that I had been searching for since embarking on my own App Developing mission a year and a half ago. This group of individual, independent, family-friendly developers have come together to share their best practices on making and marketing mobile apps. Most of the members are parents who have launched their own apps on the App Store. It is a warm and wonderful group of people who are willing to share their time, their tips, and their ideas on the best practices within the world of iPhone App development (and let me tell you, it is a scary world). A tool that will simplify the discovery process for Kids and Parents and gives an organized voice for family-friendly Apps. 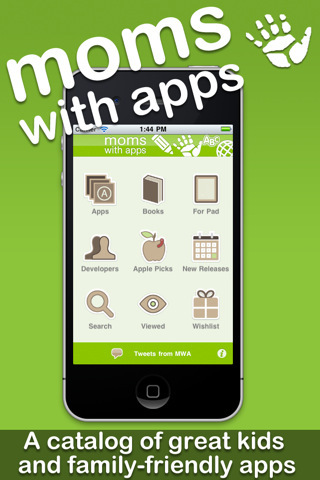 This App, aptly called the Moms With Apps App, is a catalogue of great Children and Family Friendly Apps. It allows you to search by both Category AND Age in the most organized method I have seen to date. It contains over 600 Apps from this group of developers, recommends ages for each, allows you to keep a wish list of your favorites, and even lets you share them through your social media networks. It is a godsend to those of us who want to weed through all of the Apps that may not be appropriate for our families. And?? It is FREE! What? Yes. I said it! It is FREE!!! You can download it HERE, right now. The App that resulted from the efforts of Andrew, of BabyBinks, and everyone else that was involved in this endeavor, is the only of it’s kind. It is the App that should be the go-to tool for all parents to navigate the inundated terrain of the iTunes App Store. I feel honored to have my own App, Cook IT Allergy Free, included in this Catalog under the Parents category, in the Health and Lifestyle Subcategories. I am so grateful to the Moms With Apps crew, for creating such an amazing community, and for offering such a unique tool for all of us looking to find the best Family Friendly and Educational Apps and Books out there. Make sure to go check out the new FREE Moms With Apps App right now in the iTunes Store! And do not forget to check the Moms With Apps website every Friday for App Fridays when one or more great Educational or Family Friendly Apps are featured and set to be Free for the day! Now if I only had an i-device 🙂 It’s on my vision board and then I’ll be back to check this out. What a great idea! I’ll try to get Pete to download it, he doesn’t deserve an iphone, I don’t think he has a single app. Can you believe that! It’s a crime and maybe I should confiscate his phone so it can finally reach its true potential. Heehee. How cool! Maybe I need to put an iPhone on my vision board like Maggie! And, Maggie, yes, I think an iPhone with no apps should be confiscated … or at least shared. 😉 You are everyone’s leader in helping navigate the i world, Kim! This is PERFECT, thank you so much for sharing Kim…I get absolutely lost in the app store, LOL!